I have worked as a District School Counsellor and District Guidance Officer for the Department over the past 28 years, in a number of regions in NSW. giving feedback and receiving and dealing with phone calls from parents, schools (interstate and intrastate), various health professionals and support agencies. While dealing with the above tasks, school counsellors confront and deal with issues such as child sexual abuse, physical, psychological and emotional abuse and neglect, grief and loss, suicide and self-harm, student pregnancy, drug addiction, gambling addiction, homelessness, family conflict, aggressive parents, divorce and separation impact on students, peer group conflict (bullying, teasing), mental health issues (depression, anxiety, trauma, conduct disorder, emotional disturbances), physical disabilities and integration of these students, school refusals, distance education applications, cross-cultural and transgender counselling, and keeping client/counsellor confidentiality. This reflection indicates the dynamics and the uniqueness of the school counsellor’s role in their schools and districts. There are no other qualified staff in our education system that come close to dealing with such issues on a daily basis. I note that school counsellors are on the same rate of pay as class teachers, and SPEs (Senior Psychologist Education) and DGOs (district guidance officers) are on the same rate as head teachers. It’s time to review this inequity for the work output, bearing in mind that school counsellors have completed post-graduate studies. All counsellors should be on head teacher wages, and SPEs should be on assistant principal salaries. There are options for teachers to gain higher accreditation and higher pay, but not for school counsellors. I also note that casual teachers are paid at a higher rate than a casual counsellor in our system. 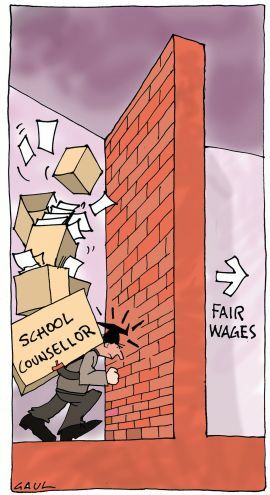 Our union needs to push the case strongly for a better wage structure for school counselling. Their workload today is more complex, intense and time consuming than when I first started. School counsellors are dedicated to their roles and are strong advocates for the needs of children in every NSW school they work in. When I retire this year I will have provided a counselling service to 60 schools during my career, and have vivid memories of my times in six different districts in NSW. I have been fortunate to have proficient and skilful district guidance officers, SPEs and district school counsellors in every patch I have worked in. They work hard to facilitate highly functioning teams of counsellors in our schools. Pay them what they are worth!